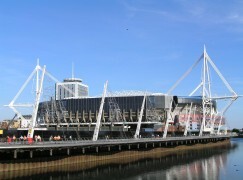 Welsh fight fans will get an early Christmas present when Cardiff hosts a crunching cruiserweight clash between Craig Kennedy (5-0, 3KO) and Wayne Brooks (6-3-2, 3KO) for the vacant Welsh title. 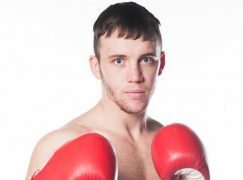 Matchmaker Steve ‘Sammy’ Sims revealed to BoxingWales that the fight will headline the Warrior Promotions show at the Sport Wales National Centre in Sophia Gardens on Friday December 13th. Sims said, “It was a hard fight to make, as most good fights are, but it’ll be worth it on the night. They’re both coming to win and they’re both big bangers, sooner or later someone will get hit hard. “I don’t see how it can’t be a good fight, they’ve both got skills but they like to fight. There isn’t just Welsh pride on the line here, they’re both from Cardiff and this has all the ingredients to be a top local derby.” Under the guidance of former world champion Steve Robinson, Kennedy has impressed since his debut by keeping busy with five fights since February. Kennedy’s careful counter-punching combined with his power has seen the 28-year-old become an attraction in the capital and he’s amassing a fast growing fan base. Brooks, a year younger, has been awfully inactive since taking a break from boxing in 2010 after a Prizefighter tournament attempt. The 27-year-old came back in February and needed just a round to dispose of the normally durable journeyman Paul Morris. Although Brooks didn’t get the rounds, he demonstrated how dangerous he is and on paper, he’s Kennedy’s toughest test yet. Both Kennedy and Brooks will have warm up bouts on November 29th in London. BUCKLAND BACK IN ACTION Until August, Gary Buckland (27-3, 9KO) had never fought in Cardiff during his eight year career but now he’ll box twice in a row in the capital as he heads the undercard. 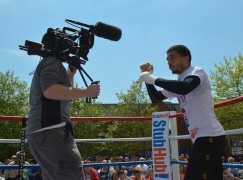 Buckland, former British super-featherweight champion, returns to the ring for the first time since his knockout loss to Stephen Smith in August. Newport’s Jerome Samuels (4-5, 1KO) continues his career turnaround and he’s pencilled in to contest the Welsh light-middleweight title in his hometown on February 21st but he must first overcome the game Gareth Piper (1-8-1), an owner of a misleading record who always comes to win. Cardiff’s Lewis Patterson could be challenging for a Welsh title for the second time, this time at light-heavyweight against Aberystwyth’s tough Jamie Ambler. This bout is subject to board approval. 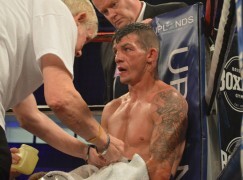 Patterson was unlucky in March when he faced Tobias Webb for the Welsh super-middleweight title, Patterson started brightly but a badly broken hand forced him to retire after four rounds. 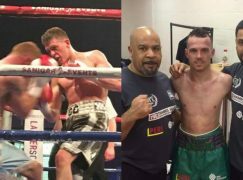 Jay Harris meets Darren Pryce in a super-flyweight fight and Peter Ashton looks to return to winning ways against North Wales’ Liam Ellis. The show also includes Francis Luke Robinson, Frankie Borg, Dale Evans, Tony Dixon, Lance Sheehan, Rob Turley, Rhys Saunders and Romeo Romaeo who are all yet to be matched.